PSG 1-1 CHELSEA: Despite the draw, I am disappointed with our performance. Despite it being a positive result, I am disappointed to be honest. I thought that Chelsea could have produced so much more last night against Paris St Germain and plenty of players played within themselves. However, looking at the result and the fact that we didn't lose but took an all important away goal from the Parc Des Princes last night, you have to hold your hands up and say that it was great game management from Jose Mourinho's team last night. 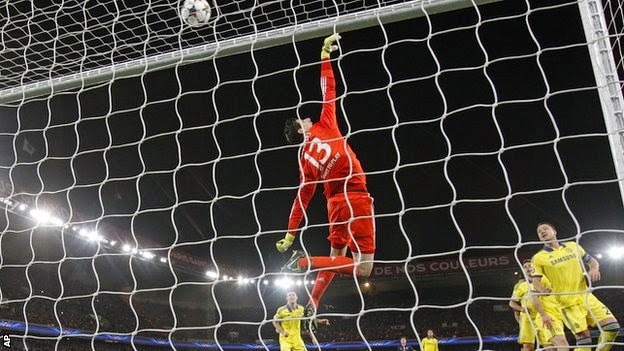 OK, granted at times Thibaut Courtois was called upon to make some important saves to keep us level but that's the way it goes in the Champions League. You take what you can from the first of a two legged tie and we can only be happy with what we achieved in what turned out to be a difficult second half. So back to our own performance and the fact that I believe that Chelsea played well within themselves. The manager revealed to the media after the game that FIVE players had not been able to train properly in the build up to the game for various reasons despite the public "show" for the camera's. That was a surprise being honest. Diego Costa upon his return to action found himself as a passenger during the game with little support or service. Of course it will be different at the Bridge in three weeks but I would have like to have seen Chelsea really go after the home side last night. During the first half, PSG sat off of us as Chelsea dominated the ball. The point is that we did little with it to test their back four. We all sat there and saw it, runs were made in-between the lines or down the channels to try and open things up in the final third but we delayed the pass to long. We needed to be more incisive in possession and with our passing. I also believe that the pace and power of Premier League football is something that teams on the continent struggle to cope with. At Stamford Bridge Chelsea will up the tempo of our game, play more direct and at pace and this is where we have beaten teams at home in this competition time and time again! I guess it comes down to game management because at the end of the day, PSG needed to get a result last night and some sort of advantage to take to London because they know just how hard it will be. Laurent Blanc and his side wake up this morning knowing that they MUST score at Stamford Bridge or they are out. I have said in the past that I am not to question he manager and his decisions and I reaffirm that point this afternoon. I just can't help but feel that there was so much more in the game last night for us and I am disappointed that we didn't play better. What did you think of the performance and the result?